In this article I suppose that you have a good understanding of SQL already. I will introduce some concepts very briefly before moving on to Common Table Expressions. How is SQL processed by SQL Server? First determine where the data will come from. This is indicated in the <table list>. This list can contain zero or more tables. When there are many tables, they can be joined using inner or outer join operators, and possibly also cross join operators. At this stage we consider the Cartesian product of all the rows in all the tables. In the third query we combine the tables, without a join operator. The result will be all the combinations of employees with orders, which explains the 7479 rows. This can escalate quickly. This will be handled exactly the same as query 3, but now I know that this is on purpose. Once we know which data we are talking about, we can then filter using the <row predicates> in the where clause. This will make sure that soon in the process the number of rows is limited. In most join operators there is a condition (inner join T1 on <join condition>) which would be applied here, again limiting the number of rows. The predicate E.empid = O.empid will make sure that only the relevant combinations are returned. 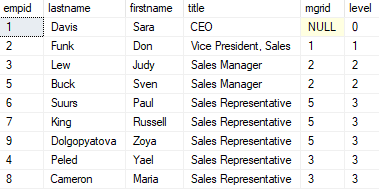 If there is a group by clause, that happens next, followed by the filtering on aggregated values. 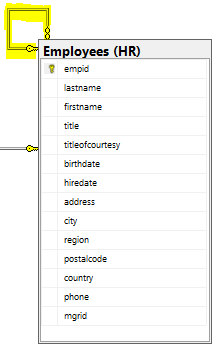 Then finally SQL looks at the <field list> to determine which fields / expressions / aggregates to make available, and then the order by clause is applied. Imagine a join between 3 tables, each containing 1000 rows. The resulting virtual table would contain 1.000.000.000 rows, on which SQL would have then to select the right ones. 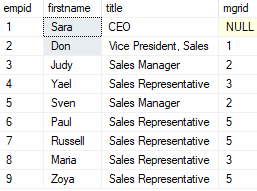 Through the use of indexes SQL Server will only obtain the relevant row combinations. Each DBMS (Database Management System) contains a query optimizer that will intelligently use indexes to obtain the rows in the <table list>, combined with the <row predicate> from the where condition, and so on. So, if the right indexes are created in the database, only the necessary data pages will be retrieved. This example will first create a virtual table named E as the result of the inner query, and use this table to select from. We can now use E as a normal table, that can be joined with other tables (or inner queries). Tip: It is mandatory to give the inner select statement an alias, otherwise it will be impossible to work with it. Even if this is the only data source that you use, an alias is still needed. This query will give me the correct results. I just had to adapt some things from the initial query because the IN clause requires a list of values, so we can only return 1 value (the [orderId]. The order by clause then needs to use the full expression. Don’t worry, no more calculations than needed will be done. Trust the optimizer! To further evolve this query we can now use an inner join instead of WHERE … IN. The resulting execution plan will be the same again, and the results too. What this does is to create a (virtual) table called cte, that can then be used in the following query as a normal data source. Tip: the semicolon at the front of the statement is not needed if you just execute this statement. If the “with” statement follows another SQL statement then both must be separated by a semicolon. Putting the semicolon in front of the CTE makes sure you never have to search for this problem. The CTE is NOT a temporary table that you can use. It is part of the statement that it belongs to, and it is local to that statement. So later in the script you can’t refer to the CTE table again. Given that the CTE is part of this statement, the optimizer will use the whole statement to make an efficient execution plan. SQL is a declarative language: you define WHAT you want, and the optimizer decides HOW to do this. The CTE will not necessarily be executed as first, it will depend on the query plan. Now, for us humans we have split the query in 2 parts: we first calculate the 3 best orders, then we use the results of that to select their order details. Like this we can show the intent of our query. In this case we use the CTE only once, but if you would use it multiple times in this query it would become more useful. In this table we see a field empid, and a field mgrid. (Almost) every employee has a manager, who can have a manager, … So clearly we have a recursive structure. We can see here that Don Funk has Sara Davis as a manager. Notice that a LEFT join operator is needed because otherwise the CEO (who doesn’t have a manager) would be excluded. As explained before we start with a semicolon, to avoid frustrations later. This is our starting point for the recursion. Using UNION ALL we now obtain all the employees that have Sara as a manager. This is added to our result set, and then for each row that is added, we do the same, effectively implementing the recursion. To make this more visual I added the [level] field, so you can see how things are executed. Row 1 has level 0, because this is the part of the query (0 as [level]). The for each pas in the recursive part, the level is incremented. This explains perfectly how this query is executed. 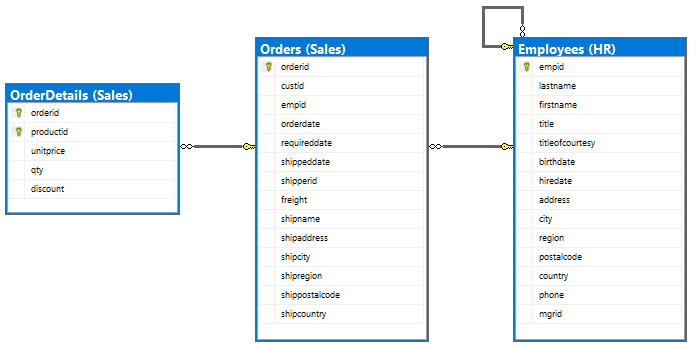 Common Table Expressions are one of the more advanced query mechanisms in T-SQL. They can make your queries more readable, or perform queries that would otherwise be impossible, such as outputting a hierarchical list. In this case the real power is that a CTE can reference itself, making it possible to handle recursive structures. This entry was posted in Codeproject, Databases, Development, SQL and tagged Common table expressions, CTE. Bookmark the permalink.